This story from the Bible is about Jacob. If you don't remember he had a twin brother named Esau who he tricked out of his blessing from his father Isaac. Even though they were twins, Esau was born first so he should've received the special blessing from his father, not Jacob. Jacob and his mother Rebekah tricked Isaac by making Jacob seem hairy like his brother Esau. Since Isaac could barely see he wasn't able to tell who was who. In the end Esau was very upset that he didn't receive the special blessing so he decided he would kill Jacob as soon as their father died. It may seem very wrong that Jacob took Esau's blessing but it was supposed to happen this way. The Lord told Rebekah when she was pregnant that she had two nations inside of her, one would be stronger than the other and the older will serve the younger. So even though Jacob wasn't originally supposed to receive the blessing, this is the way God wanted it to be. Rebekah knew about Esau's plan to kill Jacob so she told him to get out of town until Esau wasn't so mad anymore. So Jacob left. I'm thinking Jacob either walked or was riding a horse and at the end of a long day of travelling he decided to stop for the night. It must have been a warm evening because Jacob just slept under the stars. He didn't have a pillow with him (which even if he had, I'm not sure they would be anything like the pillows we have now), so he found a good size stone to lay his head on. He must have been tired because he fell into a deep sleep and began to dream. First he saw a long stairway that touched the ground, with the very top of it reaching heaven. Maybe in his dream heaven was where the clouds were, it doesn't say. 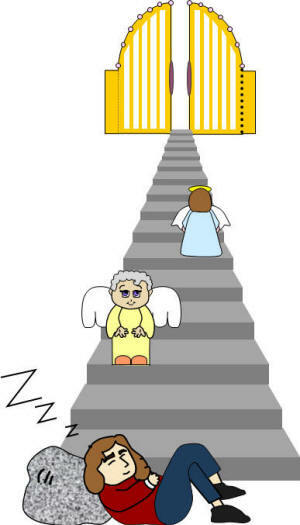 Next he saw angels of God moving up and down the stairway. I imagine they were floating just above the stairs almost like one escalator going up and the other down. Above the stairway or even close to Jacob stood the Lord. The Lord then spoke to Jacob saying, "I am the Lord, the God of your father Abraham and Isaac. I will give you and all your family to come, the land on which you are lying. Your family will continue to grow through each generation, as much as the dust of the earth" (which is LOTS!). "All of your family will spread out all over and you will bless those around you. I will always be with you, watching over you and will return you to this land until I have done everything I have promised you." When Jacob woke up he realized that the Lord had been with him there. He was afraid because of the power and presence of God and said, "How awesome is this place! This is the house of God, this is the gate of heaven." Before he left, Jacob used the stone that he rested his head on and set up a pillar and poured oil on it. This is like a marker for Jacob to remember the dream he had from God and to remember and thank God for the promise He made to him. He called the place Bethel which means House of God. Then Jacob made a promise to God, "If God will be with and watch over me on my journey and provide me with clothes and food, and bring me back home safe; then the Lord will be my God and the pillar that I have made will be God's house, and all that you give me I will give one tenth in return." Jacob had an amazing experience. I'm sure no one would be able to convince him that his dream wasn't a special message from God just for him. God can speak to us in many ways: through other believers, our conscience, through his creation, and through dreams as well. Of course we all have bad or crazy dreams but I think if God really had something important he needed us to know he could speak to you in a wonderful dream and you would know without a doubt that it was a special message just for you from God.